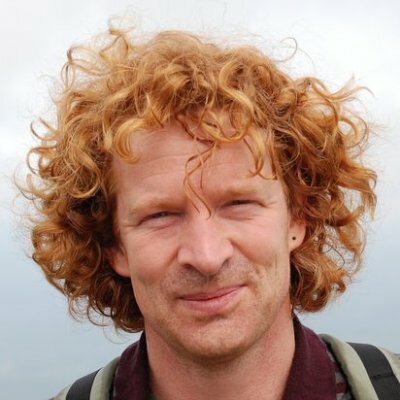 Hi Jeroen, can you explain to the people unfamiliar with ecosystems what web food models are and why they are so important? Quantitative models are not required for the analysis of a food web. A conventional food web model theorizes behaviour, most popularly expressed as probabilistic statements or as a system of deterministic equations. Food web models are fundamental in the ecology field to determine the processes that shape the complex networks formed by species and their feeding relationships. The topology of these networks is a major determinant of ecosystems' dynamics and is ultimately responsible for their responses to human impacts. The ability to predict the future state of ecosystems is particularly important in the marine sector. We know that single species models are commonly used to make predictions in the fisheries sector. 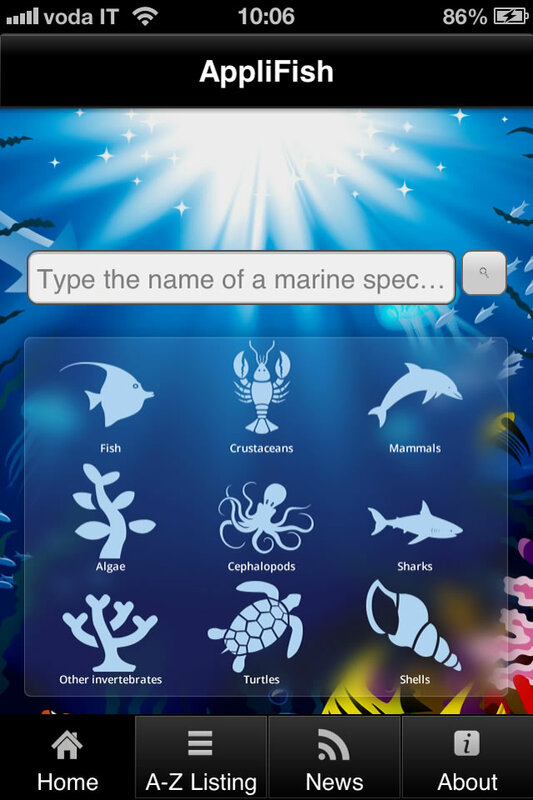 What’s the difference between single species models and food web models? Single-species fisheries models are unable to capture interactions between species (especially trophic interactions) and do not accommodate spatial aspects of fish stocks and their prey and predators. Careful consideration and quantification of trophic interactions is important when addressing management objectives to exploit or conserve species that may be interacting strongly with a particular species targeted by fisheries. Information on the spatial distribution and overlap between species is also needed if closed areas are to be implemented as effective management tools. That’s why different approaches and techniques that than supplied by single-species assessment methodologies are needed and that’s why we are promoting the usage of the Ecopath with Ecosim (EwE). Jeroen, can you tell us more about EwE? The ecosystem modelling approach of EwE (through Ecosim and Ecospace) offers a means to incorporate interactions and spatial constraints into an approach in which fisheries effects can be explored and carefully examined providing a useful tool for ecosystem –based fisheries management. The ‘Ecopath’, later expanded to ‘Ecopath with Ecosim’, modeling approach has been applied to hundreds of ecosystems around the world, since its first conception in 1984. Overall, most models were built to analyze ecosystem functioning and fisheries, principally in the Northern and Central Atlantic Ocean. During the first decade (1984–1993), most EwE applications were Ecopath models representing tropical marine systems and using simple food web representations to analyze trophic functioning only. Over the last two decades (1994–2014), EwE models were applied to study a wider variety of ecosystems, including polar regions and terrestrial systems, and a wider range of research topics , including pollution, aquaculture and Marine Protected Areas. and Ecospace, a spatial and temporal dynamic module primarily designed for exploring impact and placement of protected areas. This sounds like a really cool tool, who is currently using it? Currently Ecopath is distributed freely and has around 7000 registered users representing 150 countries and more than 400 ecosystems models. Most of the models (42%) have been constructed to describe the structure of ecosystems and their food webs, while 30% are aimed at fisheries management issues, 11% theoretical ecology, 9% has been to address policy questions, and some 6% were constructed to address questions related to protected areas. A real example of usage is documented by the Vancouver harbour case. The Robert Bank Terminal 2 (RBT2), Vancouver, BC, project proposed to increase the size of the port, adapting to the increase in demand for container shipping traffic which is expected to triple by 2030. 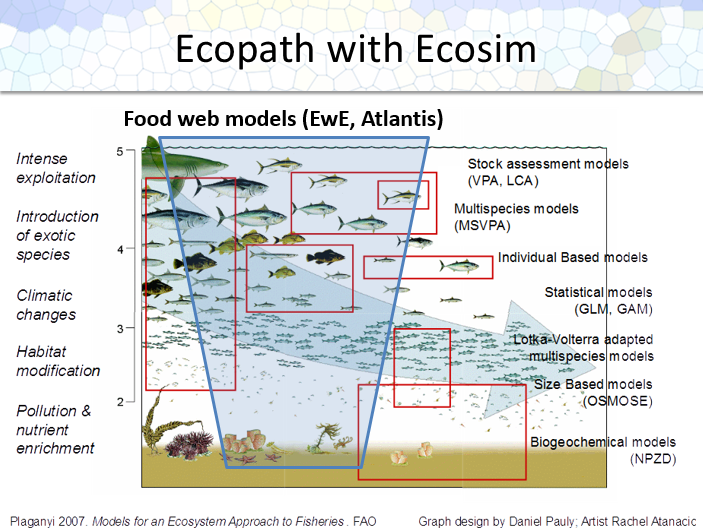 To understand the impact of this change on the ecosystem, the project leaders enlisted help from food web models, in particular of the Ecopath with Ecosim (EwE) model. Making predictions of the future state of the marine ecosystem of the Vancouver port was an exciting experience because we were able to see how ecosystem models could impact real world decisions. Through the EwE models, the project leaders of the Vancouver port were able to understand in advance the impact of the extension of the port on the marine resource dynamics, EwE infact has shown that the build of the extension to the port was not that environmentally impactful and so none of the counter measures foreseen by the initial project were needed. However, its usage could be even wider. Unfortunately at the moment we are dealing with some technical limitations: only a Windows desktop version of Ecopath with Ecosim is available and usually running ecosystem simulation models requires large computational resources to which some people may not actually have the access to. In addition, the key for good predictions are good data. Different data in different formats, which correspond to majority of the situations in which the users of EwE work, require huge efforts to decipher the data and resources in setting up the models. Is this the reason why you thought to ask the help of BlueBRIDGE? enrich the suite of models currently available via Ecopath and make them available for researchers form everywhere in the world. Thanks very much, Jeroen. We look forward to finding out more about the EwE developments in BlueBRIDGE !